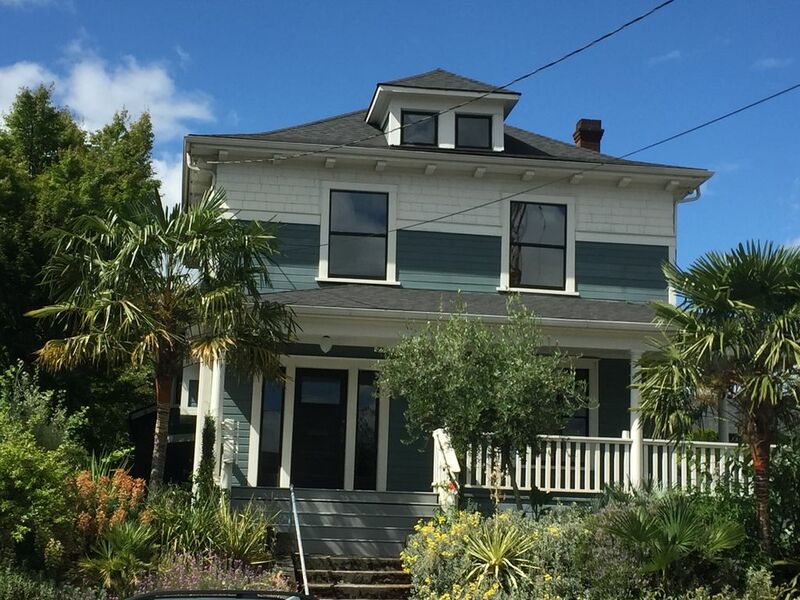 Bienvenue à Multnomah House, une maison d'hôtes Portland classique située dans la ville centrale. Construit en 1904 et maintient tout le charme historique, mais avec les commodités d'une maison moderne. Parfait pour les visiteurs qui veulent la commodité et la proximité de tout Portland a à offrir avec le pittoresque de l'un des quartiers les plus anciens de Portland. Construit sur le vieux réseau de tramway, vous pourrez profiter de la nourriture étonnante, des sites, des magasins et de la vie nocturne tout à distance de marche. La cuisine est grande et classique avec des lambris de métro et de belles installations. Entièrement rempli avec tous les éléments nécessaires pour préparer votre repas de jour. Caractéristique moderne comme un lave-vaisselle et micro-ondes également prévu pour les exigences de la vie réelle. Il y a deux salles de bain. À l'étage principal, faites l'expérience de la vie du bain turc moderne. Des toilettes, un lavabo et de grandes douches doubles peuvent vous faire chanter pendant des heures. À l'étage supérieur se trouvent des toilettes, un lavabo et une grande baignoire / douche en pied de griffe où vous pourrez vous imprégner et réfléchir aux aventures vécues ou à venir. Salle à manger formelle, salon et salle de télévision vous fera vous sentir comme à la maison. Il y a 5 chambres, avec trois lits doubles et deux lits doubles, ainsi qu’un futon complet dans une chambre. Les étés peuvent être dégustés sur le grand porche en profitant du jardin méditerranéen. J'ai un accord de 22 heures en dehors du temps calme avec mes voisins et il est strictement appliqué. Il y a actuellement des travaux de construction de l'autre côté de la rue. C'est assez raisonnable car ils sont en train de se terminer et seront terminés pour l'été 2019. Si vous avez l'habitude de vivre dans une ville, ce ne sera pas très visible, mais si vous vivez dans une zone rurale, ce sera probablement le cas. Dans l'attente de vous accueillir et vos invités. A group of us rented Will's house for a conference. Its close proximity to the conference center meant we could walk to and from each day, which worked well. The house is so charming. Everything is restored and decorated tastefully. Will made sure we had everything we needed--extra blankets, another table, a bottle of wine--to feel at home. As in so many areas in Portland currently, there was construction across the street which woke us up early one morning. Will talked to the crew and came back with details of what we could expect the next few days, which were much quieter. I am a light sleeper and Will offered to refund us all our money if we needed to move which I appreciated but am SO thankful we didn't need to move because staying here felt special. All week my friends spoke glowingly about how beautiful the house was, how attentive Will was, and what a good job I did in finding it. I couldn't agree more! Will was very responsive to any questions and completely accommodating to and need or requests. Will stay here again. Right on the transportation line, it was incredibly easy to navigate from the airport, to Will's, and all around town. House was in great shape, cosy, with a lot of character. My group enjoyed our stay at this beautiful home. The house is perfectly located within walking distance to restaurants and spacious for our work stay. Highly recomend it! Six of us, ranging in age from 11 to 76, stayed in Will's home over Christmas. We cooked virtually every meal in the kitchen (and only set off the smoke alarm once! ), ate our meals and played MANY games and rounds of cards at the beautiful large dining table, had a giant puzzle going on the living room coffee table, and even caught a few zzz's on the sofas. For those of you traveling with old folks or others who can't manage stairs, the main level bedroom and giant bathroom are perfect; and the rest of us created our own level upstairs. Will was terrific and flexible both at check-in and check-out, and particularly with respect to some unexpected very early Sunday morning construction noise that woke us all up before 7am. The house is older and has its quirks (don't run the microwave and the toaster simultaneously! ), but we got used to it in no time. Highly recommend! The security deposit of $500 is required to hold the house and will be deposited the refunded on departure, given there is no damage or violations of the booking agreement. Half payment is due when you book and the balance due one month prior to arrival. There is a $200 cleaning fee for stays under 7 nights and an 11.5% occupancy tax charged on the nightly stay. There is a 4 night stay minimum over Thanksgiving, Christmas and New Years.